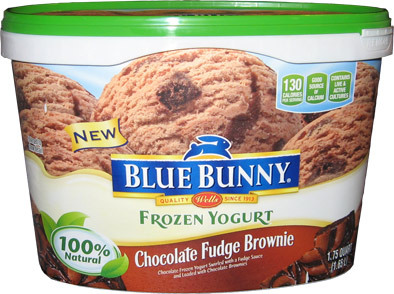 [New for 2013] Blue Bunny is dishing up two new frozen yogurt flavors this year and they sent them both over for me to try. I've liked their all natural frozen yogurt since I first had it. Last year they improved their formula and started calling it Naturally frozen yogurt, and now they've changed the name yet again, this time to 100% natural frozen yogurt. Confused? Don't be, it's just semantics. Now every now and then a container gets devoured before I can give it a full bowl-sized shake down, but I have sampled this 3 or 4 times now, so we can still get through the basics on this one. This flavor continues the clean taste of the other frozen yogurt varieties. 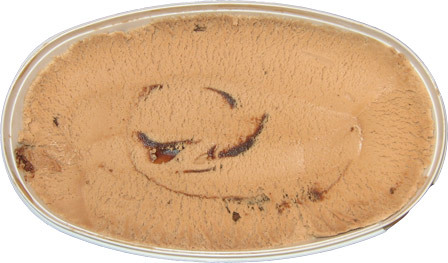 It's not overly complicated or potent, just a mild milk chocolate flavoring in a light, crisp texture. They're no gumminess or funky mouthfeel. It's all good, plain and simple. I didn't notice a ton of brownie bits but they are a good size. 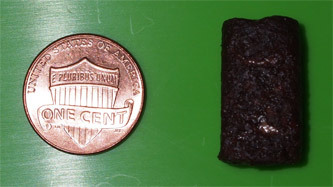 Not too solid and not too chewy (or oily), instead they are more of a cake-like brownie. They're just a little something to break things up, something to aim for. The swirl blended in to the base and didn't really stick out in my mind. Overall, it's a fine addition for anyone who digs chocolate frozen yogurt. 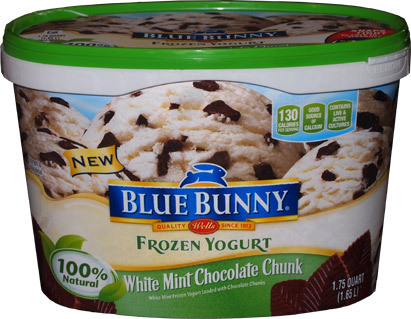 This is 100% natural Blue Bunny White Mint Chocolate Chunk Frozen Yogurt. 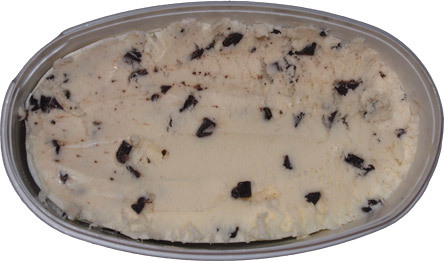 It's White Mint Frozen Yogurt Loaded with Chocolate Chunks. I just realized that I've never had mint frozen yogurt before. I mean, I know Sweet Scoops makes pints of mint froyo, but this is a first for me. I dig in and it's kind of hard to think about base texture when you've got a strong mint flavoring and tons of solid chocolate chips distracting you. I'm getting the minty mouthfeel, but not in the usual ice cream coating kind of way. There's something different to how it fades. It doesn't linger as much, plus I'm detecting a hint of something. It might just be all the chocolate chips, I don't know. At least I know it's not chemicals! (oh I do love eating all natural). It's crazy how many chips are in here. When you chomp down on a spoonful, it's like these icy mint seas that quickly part to deliver non-stop crunching. They're a fairly dry chocolate chip which I think is part of what is throwing me off. Why are they "dry" you ask? I'm guessing it has to do with keeping the fat content nice and low. Mmmm, I do love a nice light snack in the mix. There is just way too much guilt associated with eating the high octane stuff every night. ...and my bowl is empty (wait, last bite, now it's empty). Well that was funky and unexpected. Blue Bunny has gone out on a limb with this one and executed nicely. I like it, I really do. Thanks for the review! I tend to steer away from froyo but I'm def gonna give these two a try!